"Odd, isn't it? For a man to run when technically he shouldn't even be walking?" We live in a magical time, when disability doesn't have to spell the end of an active person's journey. 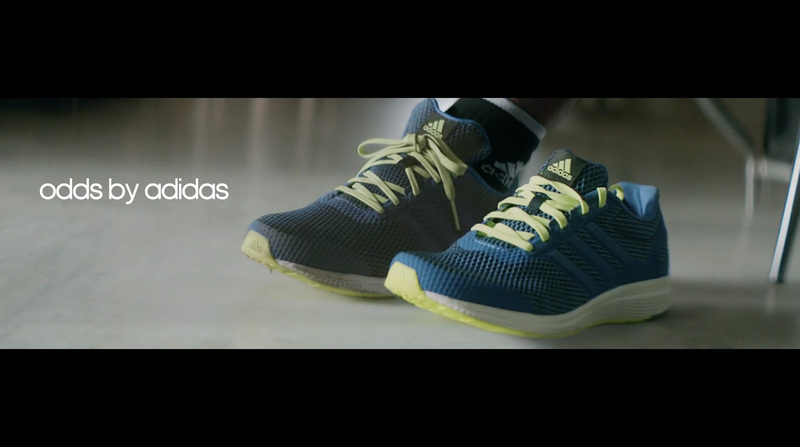 And a fascinating new Adidas campaign from India draws attention to something that has never occurred to most of us: Why should a blade-running athlete with only one foot—or anyone else—have to buy expensive athletic shoes for both feet? Enter Adidas Odds: "An even pair of two lefts, or two rights, for those who run against the odds." The first ad for the Adidas Odds collection, masterfully voiced by actor Kabir Bedi, features Major DP Singh, India's first-ever blade runner, in all his athletic glory. The unique Indian initiative comes from Taproot Dentsu and Carat Media, and stems from the insight that para-athletes should be able to buy pairs of footwear for only the right or the left foot. We also love the name, whose many meanings the campaign toys expertly with. "At Adidas we live a simple principle: No athlete left behind," says senior marketing director Damyant Singh of Adidas India. "This philosophy is at the heart of 'Odds by Adidas.' It is our way of encouraging and cheering para-athletes on to achieving their best on the field of play, and we hope Major DP Singh's story inspires many more to live their dreams and prove that sports has the power to change lives." "Losing a part of the body does not lead to disability. Losing the will to fight out odds, does," adds Major DP Singh. "Celebrate odds and be the winner. If you wish to give up anything, give up giving up. That's the message I wish to give everyone. And that's the reason I run every day."